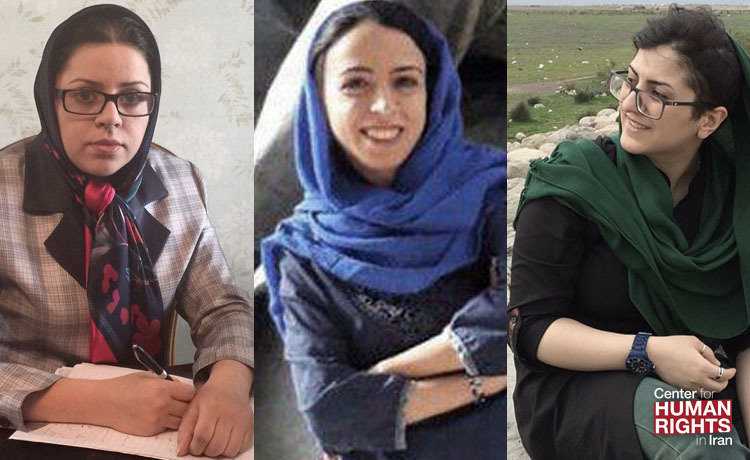 September 11, 2018-The three women's rights activists arrested by Iran's security forces since September 1-the lawyer Hoda Amid, the sociologist Najmeh Vahedi, and the gender studies student Rezvaneh Mohammadi-should be released immediately, the Center for Human Rights in Iran (CHRI) said in a statement today. All three women were involved in training workshops on equal marriage rights and other peaceful activities related to women's rights. They were all arrested at their homes without a warrant. No information regarding the charges or where they are being held have been disclosed, and the families have been denied visitations or phone calls. "Iran's authorities think they can stop people from advocating for women's rights by locking them up, but unlawful arrests will not silence the growing number of people who are standing up for women's rights in Iran," said Hadi Ghaemi, CHRI's executive director. There are concerns regarding the conditions under which the women may be being held, given the authorities' documented pattern of holding political detainees incommunicado in solitary confinement for prolonged periods and subjecting them to intense pressure and threats during interrogations with no counsel present. In addition, female prisoners who are detained are sometime subjected to gender-based violence and/or sexual abuse. Amid and Vahedi were arrested by the Islamic Revolutionary Guard Corps (IRGC) Intelligence Organization in Tehran on September 1 and taken to an unknown location. Their arrest took place three days before they were scheduled to host a workshop on Iran's marriage laws. "Amid and Vahedi did not have any mutual activities other than this educational workshop which was organized with a legal permit, so there was no excuse to detain them," a source close to the case who wished to remain anonymous for security reasons told CHRI. "Gatherings like this have been held before and continue to be held." Mohammadi was arrested at her home on September 3 by security agents. CHRI has not been able to independently confirm which organization was responsible for her arrest. During the arrest, Mohammadi's mobile phone and other electronic devices were reportedly confiscated. The authorities in Iran have increasingly cracked down on growing societal demands for women's rights in Iran, which have accelerated since the beginning of the year. For example, women in Iran are being jailed in record numbers for peacefully protesting against the compulsory hijab by removing it in public, and prominent human rights attorney Nasrin Sotoudeh has been detained in Tehran's Evin Prison since June 13, 2018 and is facing national security charges for representing these women. Hoda Amid is a lawyer who has represented numerous women before the courts pro-bono. She is a prominent advocate for gender equality in marriage through "equal marriage contracts" and has published widely on gender-based discrimination. Hundreds of women and men have participated in workshops on these contracts organized by Amid and her colleagues. Najmeh Vahedi is a sociologist who also specializes in gender studies. Over the past few years, she has focused on the fact that millions of women in Iran work without wages and retire without compensation-an issue that is increasingly attracting public attention. Hundreds of young women and men have also participated in workshops organized by Najmeh and her colleagues on gender-based discrimination. Rezvaneh Mohammadi has been active in promoting gender equality online and has participated in gender equality workshops. Mohammadi was arrested a few months ago by Gorgan city's morality police force for not wearing a hijab. She was held for one night in the police's detention center and released on bail. She was acquitted on her charge by the city court. "Women and men are increasingly speaking out against gender-based cultural repression and political and economic discrimination in Iran," said Ghaemi, "and the authorities are mistaken if they think these unlawful arrests will silence them."